an Orange County, California based spiritual center! Explore our various metaphysical classes, on-site metaphysical store, or book a session with one of our IMPART Certified psychics, mediums, or healers. 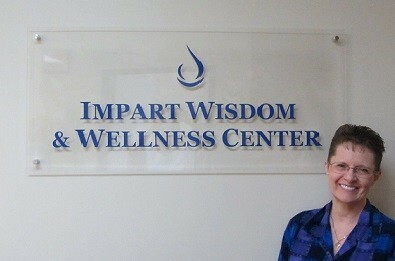 Welcome to the Impart Wisdom & Wellness Center (IWWC)! IWWC Founder, Dr. Anne Reith has been passionately supporting students in developing their psychic, mediumship, and healing abilities for over 10 years in the Orange County area of Southern California. Dr. Reith is also the Director of the Institute for Mediumship, Psychic, Astrological, and Reiki Training (IMPART). She holds all of her psychic development classes, mediumship classes, channeling classes, Reiki classes, and Karuna Reiki classes at the Impart Wisdom & Wellness Center. The IWWC is able to serve students and clients from all over the Southern California area. In addition to the various spiritual and metaphysical classes offered, the IWWC also houses a metaphysical store & wellness center. Graduates of Dr. Reith’s IMPART Certification Programs offer quality psychic readings, mediumship readings, and Reiki healing services to the public by working out of the wellness center at the IWWC. In addition, we also provide the perfect rental space for metaphysical and healing arts oriented teachers and practitioners who are looking for a space to see clients and/or to hold classes. The IWWC is centrally-located (right off the 5 or 55 freeways in Orange County) on the border of Tustin and Santa Ana in the heart of Orange County. This makes us easily accessible from all parts of Orange County, Long Beach, San Bernardino, Riverside, and the Greater Los Angeles areas of Southern California. The IWWC is located in a very unique round building called “The Theme Building”. Within the building, the IWWC is located in Suite 108, which is on the 1st floor, right off the atrium. 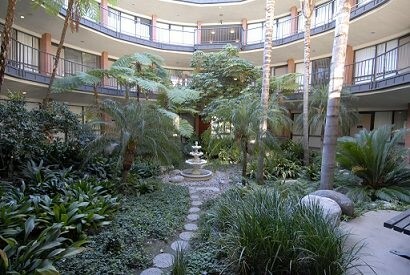 The beautiful atrium and fountain in the middle of the building are the best parts of our home. The atrium is filled with beautiful palms, ferns, and other lush greenery, which creates a feeling of peace and serenity as soon as you step into the space. Also, the large classroom and one of the smaller rooms in our suite have beautiful floor to ceiling views of the atrium. In addition to the large classroom, which seats up to 70 people, the IWWC also has three smaller rooms that range in size from 80-240 sq. ft. All four of these rooms are available to rent for practitioners, teachers, and presenters. Given the range in sizes, the four available rooms provide a great deal of versatility. For example, this would be a wonderful place for (a) individual sessions (e.g., psychic readings, mediumship readings, Reiki healings, hypnotherapy, coaching sessions, counseling sessions), (b) small classes or group meetings (e.g., up to 14 people), or (c) larger classes or events (e.g., up to 70 people). In addition to the rooms used for classes and sessions, there is also a reception area with a metaphysical store. We offer metaphysical supplies and products that support students, practitioners, teachers, and the general public in the pursuit of spiritual growth and healing (e.g., pendulums, crystals, divination cards, books, CD’s). We also have a full-sized kitchen (with a microwave and refrigerator), FREE Wi-Fi access, and ample FREE (off-street) parking. Please click here to learn more about our meeting rooms and rental rates or contact us at (714) 599-0017 or Rentals@AnneReith.com. The name we have chosen for our center is “Impart Wisdom and Wellness Center.” As many of you know, a few years ago Anne named her psychic development, mediumship, astrology, and Reiki training programs IMPART. The acronym “IMPART” stands for the Institute of Mediumship, Psychic, Astrological, and Reiki Training. Anne continues to use the name “IMPART” for her training programs and for the IMPART Certification Program for psychics, mediums, and healers. However, IMPART is now be one of several different programs that are being housed under the name “Impart Wisdom and Wellness Center.” The IWWC name reflects our essence (i.e., imparting wisdom and wellness) while also reflecting the broader scope of personal and spiritual growth services and products that are available through the IWWC. The goal of the IWWC is to provide a safe, sacred place for you grow, heal, and evolve into the highest vision that you have for yourself and your life through the various spiritual, metaphysical and healing classes, services, and products we offer. The IWWC provides a space where you can connect with yourself, with Spirit, and with like-minded people who are on a similar path. Having a community of like-minded people that you can develop meaningful relationships with is an integral part of creating a rich, rewarding, and fulfilling life. At the IWWC, that is what is possible! If this feels like a place that you resonate with, we invite you to join us! Take a look at our Calendar to see what classes and events are happening in the upcoming weeks and months. Also, if you would like to experience a psychic reading, mediumship reading, or Reiki healing with a practitioner who has been personally trained by IWWC Director, Dr. Anne Reith, please take a look at the IMPART Certified Practitioner Directory. Many new classes, services, and products will be arriving every single month, so be sure to join our email list, if you haven’t done so already, so you can receive regular updates of the new classes, events, and products as they become available. Above all, we want you to make our home your home, too! We look forward to seeing you soon at an upcoming class, session, or event at the Impart Wisdom and Wellness Center. Weekday Hours: Tuesdays & Thursdays, 2:30-6:30 p.m. Please be sure to confirm these hours by calling (714) 599-0017 or emailing us at Anne@AnneReith.com. Evening & Weekend Hours: Evening and weekend hours can vary depending on class schedules. To find out when you can visit our Center and/or store, please contact us at Anne@AnneReith.com or call (714) 599-0017. Our location is right on the border of Santa Ana and Tustin (in Southern California). Golden Circle Drive is off 4th Street and is located between the 5 and 55 freeways. The building is called The Theme Building. It is a very unique building in that it is round! At night, the building positively glows with white light! 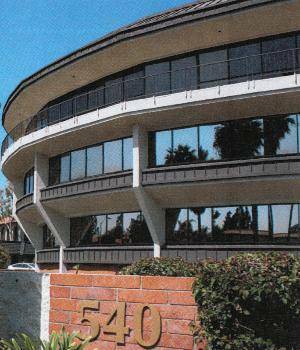 We are centrally located, right on the border of Tustin & Santa Ana, within 1 mile of the 5 or 55 freeways. For directions, click on the Red Marker on Map below.